This alert, yet friendly full-sized bi-chrome dog holds his head high as he sniffs the air for his master. 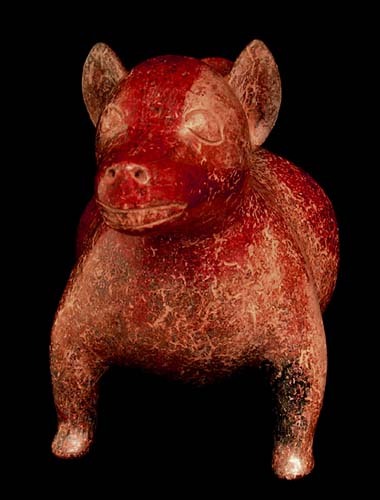 He is uniquely pigmented carmine red on a brown slip, consisting of one solid red circle on each of the dog²s rotund sides, another tapering red stripe extending from around the neck, up and over the back of the head, between the eyes, extending to the snout and mouth, and on down to the neck, completeing a collar-like coloration. The tail opens as a spout and is also pigmented red. Root markings are evident overall. Sporadic manganese oxide deposits and firing clouds complete the matrix upon the surface of this ancient animal. Dimensions: Height: 10 in. (25.4 cm. ); Length: 15.5 in. (39.3 cm.). Provenance: From a private Arizona collection formed during the 1960s-'70s.